If there’s a time to be in Águeda it’s the month of July when the town is swept up in the colour, creativity and fun of the AgitÁgueda festival. This three-week event turns the centre into an arty wonderland, with spontaneous performances and extraordinary art installations. The rest of the time it’s a peaceful country settlement where the coastal plain in North Central Portugal is broken by low-lying mountains. The Pateira de Fermentelos , the largest freshwater lake in Portugal or Spain is moments from the town and there’s an assortment of mansions, art galleries, museums and historical sites hiding in the town and countryside. A gigantic tent in the Zona Ribeira park is the base for a spirited annual cultural even that is now more than a decade old. For three weeks in July there’s a packed schedule of concerts and workshops, and the event coincides with sensational public art installations. 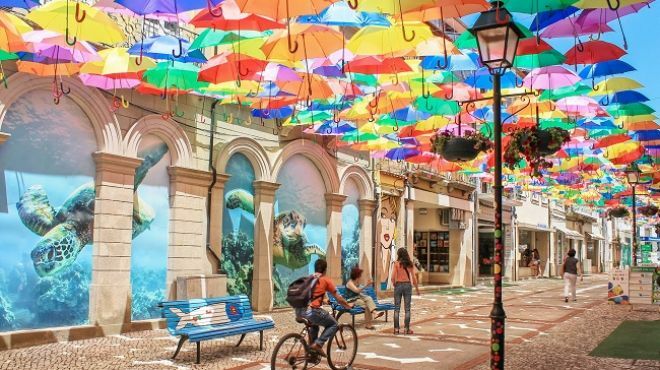 The most iconic is the Umbrella Sky Project, in which the streets in the centre of town have a kaleidoscopic canopy composed of some 3,000 umbrellas. There’s always something going on, day or night, be it urban art that transforms lampposts, shop facades, benches and stairways, or impromptu concerts, flashmobs, parades and nightly concerts. The finest piece of heritage in the Águeda municipality is a Portuguese National Monument. Trofa’s parish church has medieval origins, but was redone during the Renaissance in the 1500s. 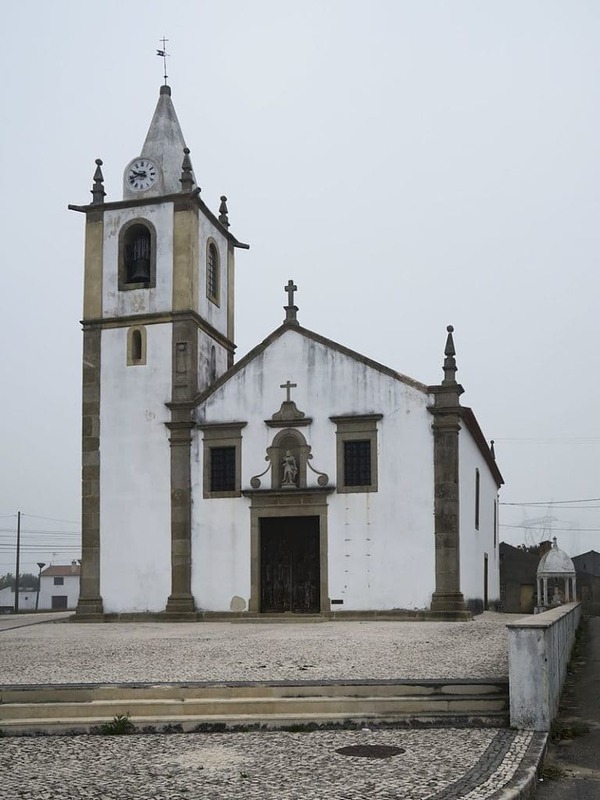 Around this time the French master sculptor João de Ruão (Jean de Rouen) was commissioned for the Panteão dos Lemos, burial place of the ancestors of the Lord of Trofa. The pantheon has of two monuments on opposite sides of the nave, with friezes, pilasters and arches carved with amazing skill from soft limestone. On the monument to the right there’s a sculpture of the Lord of Trofa in prayer with his armour at his feet. The largest natural lake on the Iberian Peninsula is seconds from the centre of Águeda. The shores of the Pateira de Fermentelos are marshy, which is just what its healthy population of resident and migratory birds like. There’s a footbridge and a wooden pavilion where you can wait for a black kite to circle overhead, or a red heron or bittern to pop out from the rushes and reeds by the water. You’ll also spot locals with rods on the banks, trying to catch carp, mullet and perch, and there are green areas for picnics, shaded by willows, spruce and poplars. 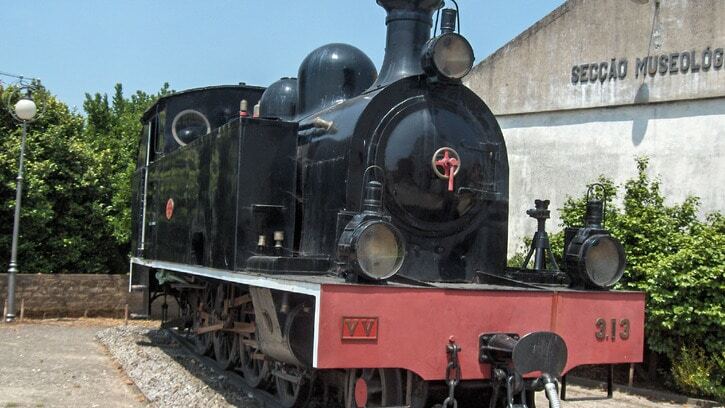 Weaving through the Vouga Valley, the Linha da Vouga railway was opened by King Manuel II in 1908, and is the last remaining metre-gauge line still operating in the country. In the old station at Macinhata do Vouga there’s lots of paraphernalia upholding the legacy of the Vouga Valley line. You can see the ticket hall from 1914, a carriage from 1942 and the interior of a postal train dating to 1954. But the inevitable crowd-pleasers are the eight restored steam locomotives, the oldest of which is from 1886. In Águeda’s hilly wooded countryside on a sandstone outcrop are the remains of a mighty fort almost 3,000 years old and reused by the Romans. It has walls up to 3.3 metres high and more than 40 metres long. In the ruins of the dwellings and defences, you’ll observe the difference between the circular primitive building styles in the Iron Age and the more sophisticated rectangular constructions that the Romans brought with them, using well-squared stones. At the time of writing the archaeological site is temporarily closed to the public for refurbishment, so check the municipality website before coming. This 18th-century townhouse is one of Águeda’s grandest properties and was saved from demolition by the municipality. 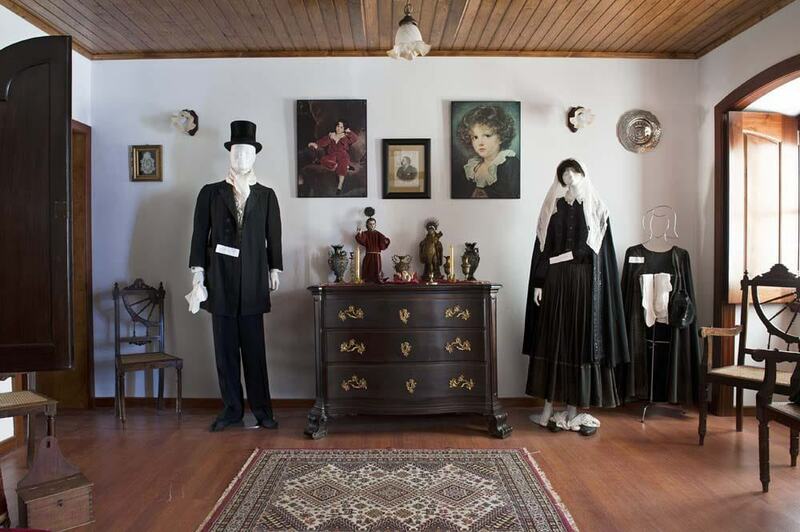 It was enriched with furniture, art and porcelain from another historic property, the Casa da Alta Vila, and gives you a perspective on the lives of the wealthy in Águeda at the beginning of the 20th century. Each room has been thoughtfully devised to reveal dining etiquette, religious customs or handicrafts, and some have mannequins dressed in the clothing of the period. In the kitchen you’ll find the only piece of furniture that was already in the house; a beautiful lacquered pine cabinet. 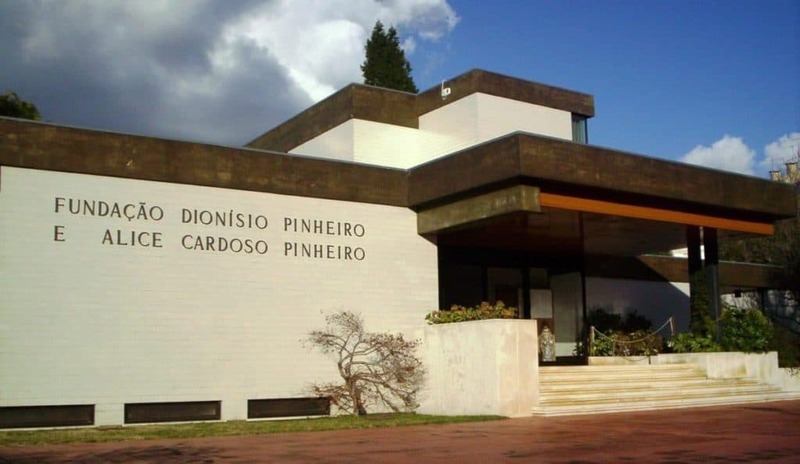 Dionísio Pinheiro and Alice Cardoso Pinheiro were a pair of Águeda-based art collectors who set up a foundation in 1969. Its job was to retain and look after the huge stash of art that the couple had assembled in the course of their lives. In 1985 this collection of painting, sculpture, porcelain, silver, jewellery, furniture, musical instruments, clocks and ivory was put on show in the six exhibition halls of this museum. Most of the pieces are from the 1300s to the 1900s, but there are also works from antiquity, like the magnificent set of Ancient Greek vessels. In an achingly picturesque scene, framed by woodland and the wide, slow-flowing Marnel River is a bridge that has been here since the 1200s. The bridge has five arches and if you take a close look at the second arch you can see the vestiges of a niche. This was for a Marian statue of “Our Lady of the Rosary”, which was moved to an oratory at the northern entrance to the bridge. The whole site is a park, with a wooden walkway to give you a better view of the bridge, linking with a small river island that has picnic tables if you want to spend a little longer in this Romantic place. Ten minutes down from Águeda in Sangalhos, the entrepreneur, vintner and art collector Joe Berardo has founded an extraordinary museum in the Aliança Wine Cellars. Down these long tunnels are exhibitions of archaeology, African art, contemporary Zimbabwean sculpture, minerals such as massive geodes, fossils, ceramics from Caldas da Rainha and antique Portuguese tiles. Some of the pieces have great cultural and historic value, while Berardo chose others for more sentimental reasons. This goes for the exhibition about Mahatma Gandhi at the end of the tour. 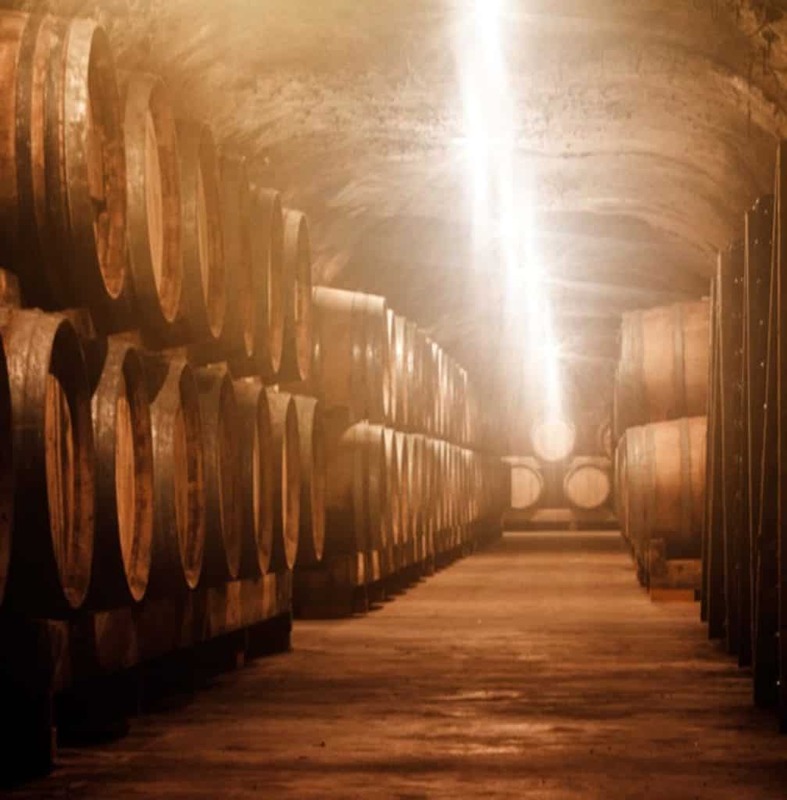 And these being wine caves, there are details about how Aliança’s sparkling wine and aguardiente spirits are made. In the middle of the 19th century Dr. Eduardo Caldeira, the owner of the property at the top of the town started transforming his grounds into a romantic English garden. Over the next few decades he planted exotic trees and built a chapel, false medieval ruins, bridges over a miniature lake, snaking paths, a greenhouse, grottos, hunting lodge and a chalet. This three-hectare park eventually became public property in the 20th century and now you can escape into Dr Caldeira’s little world for an hour or so. Águeda has invested heavily in a small network of signposted trails, six of which begin close to the town. You could set off from the town for the Pateira de Fermentelos, wander along the banks of the River Águeda, follow the route of the historic railway or go east to where the tall hills are blanketed by deep pine forest. 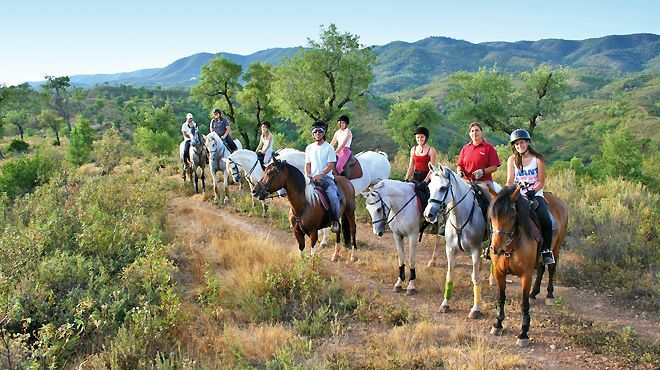 The bucolic scenery by the Vouga River is horse-riding heaven, and the stables at Abrigo d’Aventura can tailor a rides to suit you, from a lesson to learn the basics to hacks and longer treks through the wooded valley. The horses are easy-going and responsive, and your host will speak fluent English. The Atlantic is approximately half an hour to the west at Praia da Barra. But if that feels like too far to go you could settle for a the river beaches near Águeda. 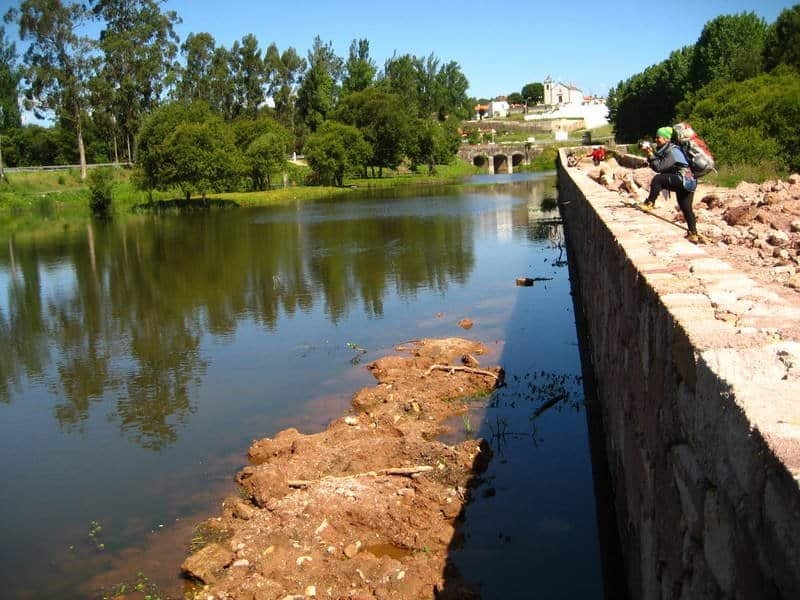 Praia Fluvial do Alfusqueiro is the closest, set on a meander in the Afusqueiro River. This river snakes down from the Serra do Caramulo and here on the edge of the range you’ll be in a deep valley decked with hardwood and evergreen forest. There’s a large sandy area, pool-like water to swim and play in, and grassy spaces with sunshades. In the summer the beach will have temporary kiosks if you need some refreshments. There’s a lot going on in this city, 20 minutes to the east. You could ride Aveiro’s canals on a wooden moliceiro boat, which looks a little like a gondola. Aveiro’s Museum is in the convent where Princess Joanna, daughter of King Afonso V passed up offers of marriage in the 1400s to live the life of a sister. Her tomb is a wonder of the Baroque, hewn from multicoloured marble. 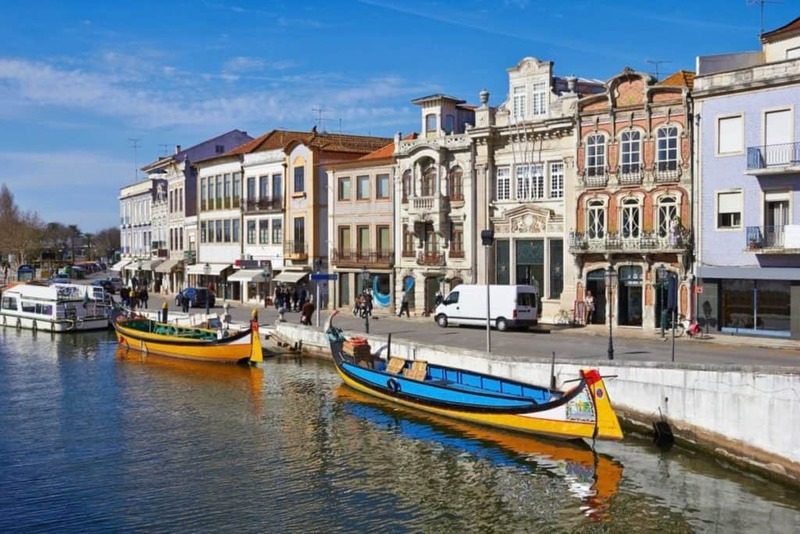 Aveiro also fronts the namesake lagoon, which has an area of 75 square kilometres. The lagoon’s salt deposits made it a centre for bacalhau (salted cod), with vast payloads of this fish brought back to the port of Ílhavo by Portugal’s “White Fleet” in the 1900s. There’s a maritime museum for this period, and you can board an enormous trawler by the canal at Gafanha da Nazaré. Águeda is in the Bairrada DOC and most of the vineyards are west of the town on the coastal plain. The mild, ocean-tempered climate, generous rainfall and sandy soil are just right for the Fernão Pires grape. This is mostly used for the region’s spicy and sharp sparkling wines. If you’re up for a wine trip there are cellars, the Caves Primavera, and three wine estates in Águeda’s boundaries. As well as white sparkling wine many produce in reds normally made from the Baga grape, for dense, robust and fruity wines. Quinta da Aguieira, Quinta do Ferrão and Quinta Vale do Cruz all welcome guests. If you want to eat like an “aguedense” you better bring an appetite. The town’s trademark dish is roast suckling pig, normally served with wedges of orange. Also cooked in the oven are kid goat and rabbit. A “lampatana” is a type of stew slow-cooked in a special clay pot, normally with mutton or goat, while rojões are pork belly fried with potatoes. The old cod port at Ílhavo isn’t far away, and has volumes of salted cod recipes: You can order it baked, pan-fried with an onion sauce or deep-fried in batter. 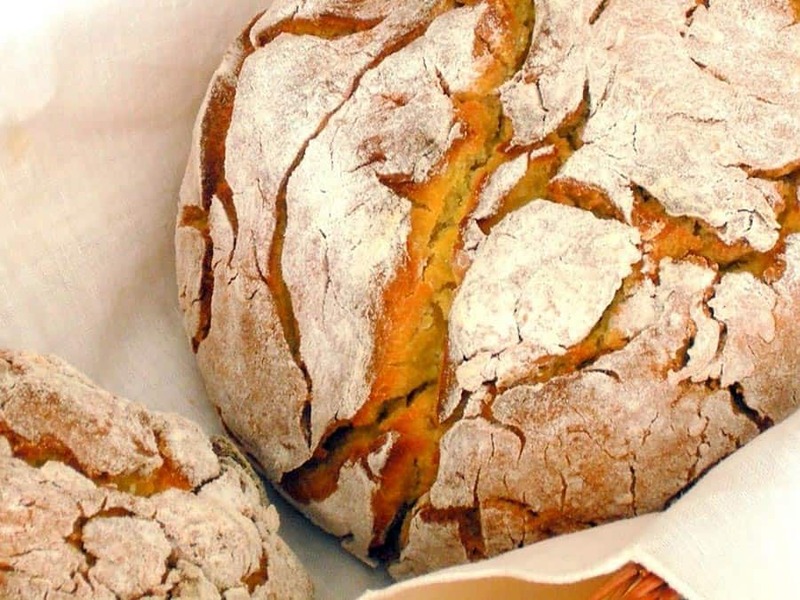 Check the bakery windows for sweets made of almond, egg and sugar that were first prepared in convents or broa do milho, bread baked with rye and corn flour.